According to the order of the rector of OshTU for No 09-04 / 89 of 23.04.2013, the Institute of Language Training and International Centers of OshTU was established on the basis of the disbanded faculty of Management and International Relations. Further, by the order of the rector of OshTU for No 09-04. 298 on December 11, 2014 it was renamed into the Institute of Language Training and International Educational Programs. Candidate of philological sciences (Ph D), Professor of OshTU. There are two departments at the institute. They are “Foreign languages”, and “Kyrgyz and Russian languages” departments. The formation and the development of the Institute of Language Training and International Centers (ILTIC) began in 1997, when the Faculty of International Relations was opened and for the first time students were admitted to OshTU in the specialties “Foreign Language and Literature”, “International Relations” and “World Economy”. After merging with the Faculty of Public management and Business in May 2004, the Institute was named “Faculty of Management and International Relations”. More than 658 full-time (among them 24 students studied on a budgetary basis) and 339 correspondent students were trained at the faculty. All specialties of the faculty had licenses for the training of students of both forms. The faculty has transferred to the Bologna education system, which requires greater attention to the quality of education and student achievement. The faculty was headed by some experienced scientists in different years. The origin of our faculty was put by outstanding persons, brilliant leaders and famous scientists. They are Doctor of Philology Sciences, Professor Tagayev M.J., who stood at the origins of the faculty; Doctor of Historical Sciences, Professor Chotonov U. Ch. ; Candidate in Jurisprudence (Ph.D.), associate professor Bakiev K.B. ; Candidate of Philological Sciences, associate professor Zulpuev A.Z. ; Candidate of Physical and mathematical Sciences, associate professor Dzhayanbaev J.I. ; Candidate of Philosophy, Doctor of technical sciences, professor Karimov A.K. 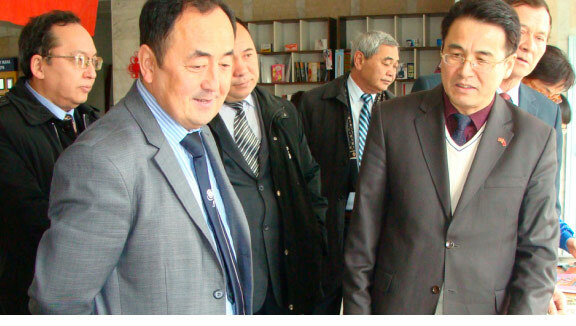 ; Candidate of Physical and Mathematical Sciences, Professor OshTU Tashbaev A.M. From 2006 till 2013, the faculty was headed by Candidate of Philology Sciences, Professor Sagynaliev M.Dzh. Since 2013, the faculty has been renamed into the Institute of Language Training and International Centers “(ILTIC). The faculty cooperated with such international organizations as the Peace Corps (USA), Eurasia Foundation, Soros Foundation – Kyrgyzstan, civil educational project, etc., with a number of universities and educational institutions – University of Minnesota (USA), Gracefeld University (Germany), St. Petersburg State University (Russia), Academy of Management under the President of the Kyrgyz Republic (Kyrgyzstan)). At the faculty the students’ internship to foreign universities, as well as to leading universities in Kyrgyzstan was well placed. Teachers and students who studied and worked at the specialty of “International Relations” had been trained and participated in the US Fulbright Program; in the DAAD program in Germany, the People’s Republic of China; at the American University of Kyrgyzstan, the students continue their studies in the magistracy at the universities in the United States, China and South Korea. At the faculty, volunteers from the USA, China and South Korea were involved and are attracted to train students in English, Chinese and Korean languages at different times. In August 2008, the Korean Center was opened at the faculty, where Korean language is taught for students of the university. The main goal of the center is to study the Korean language, culture and traditions of the Korean people. The Institute’s function includes coordinating international educational programs through the SCO University and the Russian-Kyrgyz consortium of technical universities in the development of integration processes in the fields of education, science and technology. In the direction of training through the University of SCO the following master’s programs are introduced: ecology and energy, in particular, electric power and electrical engineering, heat power and heat engineering, management in technical systems at the National Research University “MEI”. The structure of the Institute consists of the following departments – the department of “Kyrgyz and Russian languages” (head of the department is Sattarova A. – Ph.D., associate professor) and the department “Foreign languages” (head of the department A.O. Kulubekova – Ph.D. ., associate professor). The inter-faculty department of foreign languages was established in 1971 under the order No.347 / 2 to the Ministry of Education of the Kyrgyz Republic on the basis of the evening faculty of the Polytechnic Institute as part of social sciences. At the head of the department there were such experienced teachers and scientists as Dr. of philological sciences, prof. Zulpukarov K. Z., Dr. of philological sciences, prof. Tagaev M.D., Dr. of philological sciences prof. Trofimov M.I., Candidate of philological sciences, associate professor Seyitbekova S.S., Candidate of philological sciences, associate professor Kemeldinova L.M., senior teacher Sokokova Z.S., senior teacher Kamchybekova B.S. 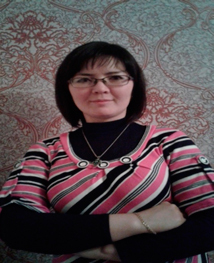 Since 2010, the Department of English is headed by Candidate of philological sciences, associate professor Kulubekova A.O. In 2011, in connection with the merger of the departments “World languages” and “English language”, the department “Foreign languages” was established. The English Department conducts educational activities in English, Chinese and Korean languages for students of non-linguistic specialties of OshTU. The teachers of the department train the students in “Practical English course”, on which educational and working programs are developed and approved. Currently, 12 teachers work at the Foreign Languages department, which serve all faculties of the university. 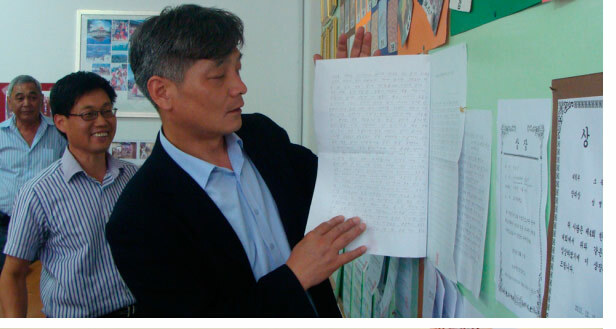 Teachers of the department teach English, Korean and Chinese languages. The staff of the department are highly qualified employees. introduction of non-traditional methods of teaching with the use of computer technology to improve the quality of education, development and publication of teaching and methodological aids, participation in scientific and theoretical conferences, and upgrading the teaching staff of the department. In the future, it is planned to strengthen the material and technical base of the department, namely: the completion of computer educational programs, video and audio materials, the expansion of the library fund and its replenishment with the necessary training materials, participation in international conferences and language courses, seminars, and strengthening contacts with foreign counterparts. use of interactive technologies in the learning process. Teachers of the department constantly improve their skills, introduce new pedagogical technologies and innovative teaching methods into the educational process, such as “Critical thinking methods in teaching”, “Development of students’ foreign languages competencies”, “New gaming technologies in the development of students’ speech activity”, “Intensive Language Teacher Training courses”. Along with authentic literatures, teaching aids and methodological instructions developed by the department’s staff are using in the foreign language classes. And also teachers actively participate in scientific-methodical and scientific-practical conferences, following the results of which for 2014-2017 periods published about 50 scientific articles. The staff of the department annually publishes the articles in the leading scientific journals of the KR and publications included in the VAK list. For conducting classes in the classrooms there are audio and video equipment, projectors, and computers. In the American resource center there are about 10 computers, a projector and an interactive whiteboard. In addition, Korean and Chinese centers are equipped with modern technologies and the necessary training materials. The department is working to improve the language skills of students, constantly organize kinds of events, such as Olympiads in languages, where the students win the prizes, educational and upbringing activities, where the students celebrate the holidays of English-speaking countries, as well as study customs, traditions and cultures of the peoples of Britain, America, Korea and China. Also, an English week is organized every year it accompanies with events such as a round table, the problems of studying the language through the eyes of a student, a seminar on the methodology of language teaching, etc. Teachers of the department publish scientific articles on language studies, the problems of teaching methodology and the role of language in the development of the country every year. Kulubekova Azarabu Omorakunovna is a Head of “Foreign Languages” Department. Work experience in: 32 years. Osh-Sejong Hakdang center of the Korean language and culture, OshTU. In 2006 he received a master’s degree in psychological counseling. Nambu University, Republic of Korea. Work experience in in Oshtu: 9 years. Kim Bu Gil is a Korean language teacher and director of Osh-Sejong Hakdang, the center of the Korean language and culture, OshTU. Professional Development: Advanced courses in Korean language; Practice of oral and written speech of the Korean language, Business Korean, Reading and analysing the Korean texts. Senior teacher of English at the department of Foreign languages at OshTU. E-mail: turgunbaevakanym @ gmail. com. Additional education: in 2016, she completed the general theory and methodology, and practical Korean language course for Korean language teachers on the program for training teachers (122 hours), Institute of International Language Education, Seoul University of Digital Technology, Culture and Art, Republic of Korea. Work experience in OshTU: 3 years. Professional Development: Russian Language Course, Buljatsky State University, Russia – 2009. Work experience in OshTU: 4 years. Senior Specialist of the American Information Resource Center of the Department of Foreign Languages, OshTU. The American Information Resource Center was opened in 2011 with the participation of the US plenipotentiary representative in Kyrgyzstan, Pamela Spratland. She often visited OshTU and met with our students and teachers. Goals, tasks, work programs, training aids and the material and technical base of the center meet all modern requirements. In the center for students there are various teaching aids, audio-video tools, computers which connected to the Internet. The main goal of the center’s opening is a deeper mastering the English language and the acquiring knowledge about the country, the American system of education, and the creation of conditions for obtaining information about the world through the eyes of Americans. The Korean Language Center was established in 2008. Currently, it trains more than 250 students and about 125 schoolchildren from the schools of Osh. In this center students of all faculties who are interested in the Korean language can learn it. For teaching the language there are appropriate textbooks and teaching aids, audio and video materials, newspapers and magazines. The center is equipped with the latest computers, TV-sets. Those who have succeeded in mastering the Korean language, have the opportunity to continue their studies in South Korea. 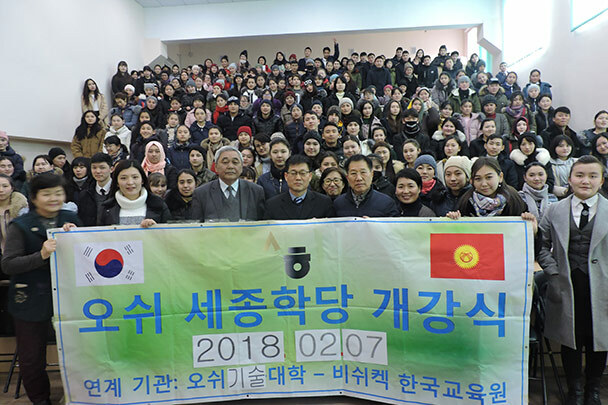 So from 2008 to the present day, the best 40 students of the center were sent to continue their studies in Korea for a period of one to five years. Of these, 14 students were sent by grant, 26 students – by agreement. In addition, studying the language, students learn the customs and traditions, the culture and the history of the Korean people. The Chinese Language Center was opened in 2010 as a branch of the Confucius Institute, founded by the Bishkek Humanitarian University and the State University of Xin Qiyang. The center has all the conditions for teaching students – this is the provision of relevant educational and methodical literature, teaching materials, and the latest computers. More than 100 students study the Chinese language, learn traditions and customs, culture of the Chinese people. For in-depth study of the Chinese language for one-year internship 14 students were sent to universities in China: Liao Ning, Xin Tiang, He Nan, Liao Cheng. The Center has close ties with the People’s Republic of China, it exists on funds and grants allocated to the PRC. The Center makes a great contribution to the spread of the Chinese language and the establishment of friendly relationship between our countries. The Department of Kyrgyz and Russian languages ​​conducts educational activities in the disciplines “Kyrgyz language”, “Introduction to Manas”, “Practical course of the Russian language” for students of non-linguistic specialties of OshTU. 1 doctor of sciences, professor, 3 candidates of sciences, professors, 1 associate professors of OshTU, 4 senior teachers and 1 laboratory assistant work at the department. On the basis of the Ministry of Education of the Kyrgyz Republic, on June 7, 1973, under No. 347/2, the Department of Social Sciences was organized at the evening faculty of the FPI. In 1990, in connection with the transformation of the evening faculty into the Osh Higher Technological College (OshHTC), the Department of Social Sciences was divided into several departments, where an independent department of languages ​​was formed. It was based on the teachers of Kyrgyz, Russian, English and German languages. In 1992 by the Decree of the President of the Kyrgyz Republic, OshHTC received the status of Osh Technological University (OshTU). In connection with the development, expansion and formation of new faculties in OshTU, with the growing numbers of students and teaching staff of the new university, there was a need to separate the department of Kyrgyz and Russian languages ​​(KRL), linguistics and translation (LT) and foreign languages. At the head of the department was prof. Zulpukarov K.Z., Tagayev M.J., Trofimov M.I. 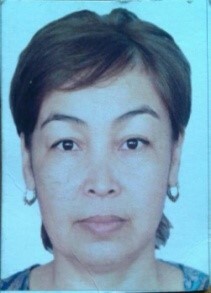 In 2004 the chair of the Kyrgyz and Russian languages ​​is headed by associate professor Sattarova A.T. In 2006 the department of the Russian language was divided into the departments of the state and Russian languages. The Department of State Language is headed by Candidate of Philological Sciences, associate professor Sattarova A.T.
From 2012 till 2017 the department of the Russian language manages Ph.D., prof. Sagynaliev M.J.
Because of the reduction in the training load of the Russian language department, in September 2017 the departments of the state and Russian languages ​​were merged into the department of the Kyrgyz and Russian languages. 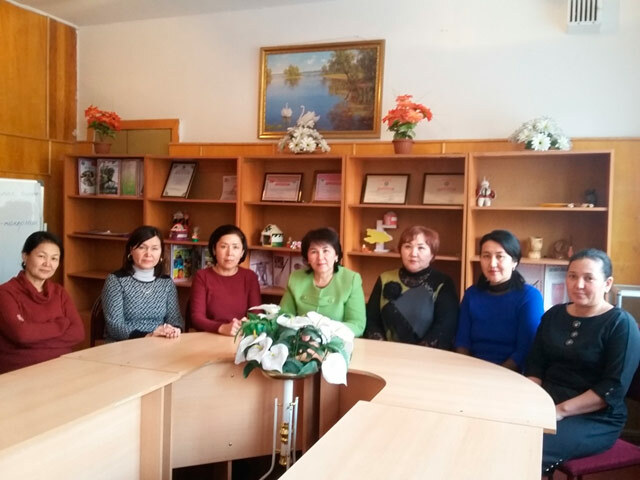 To date, the Department of Kyrgyz and Russian languages ​​is headed by Ph.D., prof. Sattarova A.T.
During the 2017-2018 academic years, the teachers of the department prepared and published 1 monographic study and 4 teaching aids. All the members of the department completed language trainings on the interactive methods of teaching. The obtained knowledge is successfully used in practical classes. One of the priority directions of the department is the organization of training rooms and their transformation into a space of creative searches. All teachers of the department work on the complex theme of scientific research “Linguistic methodological description of the state and Russian languages ​​for educational purposes”. In order to improve the qualification and professional level of teachers, the department organized a monthly scientific and methodological seminar. The Department of Kyrgyz and Russian languages ​​will continue its activity in the future to improve the state and official languages ​​and to train highly qualified personnel. Preparation of students for the Olympiad in the disciplines “Kyrgyz language”, “Russian language”, “Introduction to Manas”. 5.Организация и проведение методических семинаров. Organization and holding of methodical seminars. 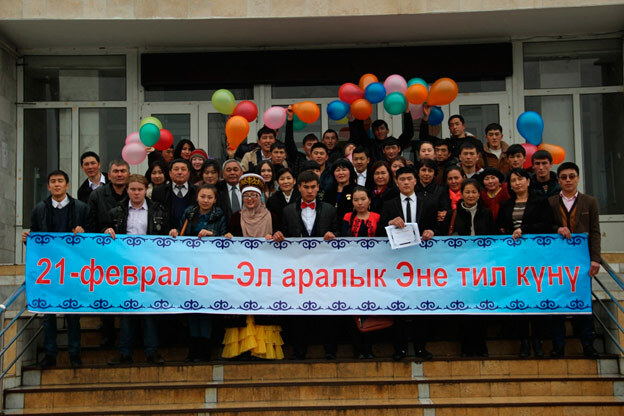 Participation in interuniversity competitions on the theme “The state language is a national heritage“. With the support of the National Commission on the State Language of the Kyrgyz Republic, the State Language Center was opened, which created favorable conditions for the development of the native language. Currently, all business papers at the university are translated into the Kyrgyz language. The translation of textbooks into the state language is considered as the main task of the OshTU. Despite the difficulties of translating technical terms, many textbooks and teaching aids have been translated into their native language and printed in the OshTU printing house. The development of state language, the upbringing of young people in the national traditions of the Kyrgyz people, the holding of various activities in their native language, organization and preparation of them is carried out precisely in this center. All the tasks of fluency in the native language, as well as assisting in the assimilation of the Kyrgyz language by representatives of other nationalities, are successfully resolved by this center. Position: head of department, Ph.D., professor, doctoral student. Academic degree: Candidate of Philology. 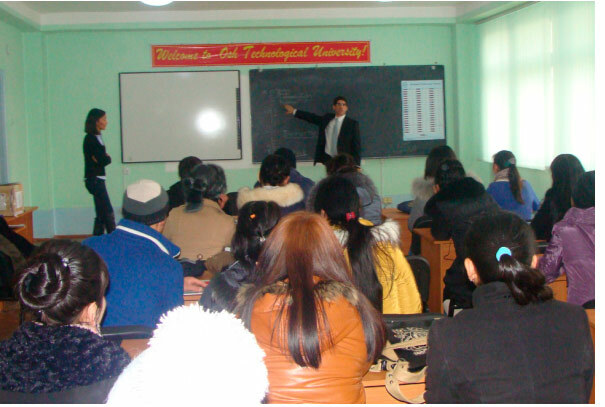 Teaching discipline: Practical course of the Kyrgyz language, Manasology. Total number of publications: 53 scientific articles, 3 monographs, 5 teaching aids. Position: Associate Professor of OshTU. Total number of publications: 6 articles. Total number of publications: 20 scientific articles, 1 teaching aids. Total number of publications: 17 scientific articles. Teaching discipline: Practical course of the Russian language. Total number of publications: 35 scientific articles, 8 teaching aids. Total number of publications: 34 scientific articles, 6 teaching aids. Total number of publications: 23 scientific articles, 9 teaching aids.